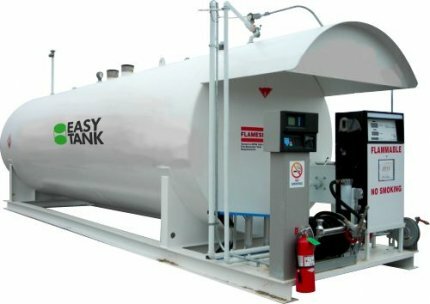 Easy Tank is an aboveground tank that comes completely equipped with pump, mini-canopy, flow meter, required electronics, and credit card access. It can be used by retailers, commercial fleets, school districts, and others wanting a simple, inexpensive way to add fuel to their operation. The Easy Tank system is a pre-engineered fully assembled code compliant package delivered to your site for easy installation. Simply provide a concrete pad with electrical service and you are ready to go. We’ll even provide pad and drawings suited to your application. An environmentally friendly economical alternative. Single Compartment or Dual Compartment — You can split the tank into separate compartments for multiple products. Dispensing Packages — A second dispensing platform can provide multiple fueling positions. Two products can be dispensed on one end with a dual product dispenser as well. Internal Tank Lining — A standard tank is bare steel. A corrosion inhibiting internal lining can be installed. Pump Systems — We often do custom pump systems for bottom loading trucks, transferring fuel to multiple remote dispensers, etc. Please ask a sales engineer about anything special. Fuel Management — We offer several fuel management system solutions from unattended retail credit card fleet keys, pin numbers, buying clubs, etc. We will also pre-install a customer supplied proprietary system.